NASHVILLE -- When thousands of National Hockey League fans enjoyed Fan Fair, 250,000 square feet of interactive hockey fun in the Music Center Saturday afternoon, NHL Commissioner Gary Bettman and MLBAM president and CEO Bob Bowman were also present, introducing the national media to new digital products that will enhance the fan experience long after All-Star Weekend is over. The redesigned NHL.com, NHL app and NHL.TV (a rebrand of NHL GameCenter Live) are scheduled to launch Monday morning, giving fans a whole new user experience. NHL.TV will allow fans to watch games on all major connected device's platforms, with a multi-camera mosaic layout for alternate angles. "You can actually watch six camera angles simultaneously for select games," Matt Restivo, MLBAM's senior director of product development said. NHL.TV will also feature DVR control. The video will also be crystal clear, at 60 frames per second and five megabits per second, Restivo said. The new NHL app will support IOS9 multi-tasking, allowing users to pull in the app from the right side and view in split screen, landscape or portrait. There is a personalization option that will allow fans to get real-time notifications for their favorite team and to follow other teams as well in order to get as much real time data as they want. In addition, the app will include a new package called NHL Premium, an out-of-market monthly service for all mobile devices that will allow fans to watch the final five minutes, plus overtime and the shootout, of every game for $2.99 per month. 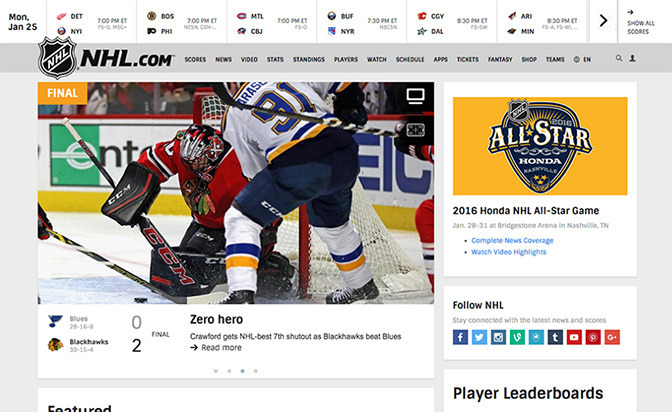 The new NHL.com will be "completely responsive, that means it will move to the device you have, and will look great on that," said Bowman, who added the new homepage will look clearer with better images and more video. Some other changes include a cleaner scoreboard, scrollable articles and new player pages with up-to-date statistics and video. "These platforms are going to give us the ability to provide more and more content to the hockey fans, and it's also going to make it more user friendly," Commissioner Bettman said earlier this week. "We couldn't be more excited and, perhaps more importantly, more pleased with the start this relationship [between the NHL and MLBAM] has gotten off to."